Click here for radiator order form to pay via money order. Now an affordable performance aluminum radiator for your H-Body. Better cooling for your 1974-77 Vega (see Vega radiator mounting) at up to 400 horsepower when you install this Griffin radiator w/ transmission cooler. For as long as performance radiators have been available, those made for the GM H-Body have always been elusive or much more expensive than a similar unit for other vehicles. Not any more, now get your Griffin Radiator here for the best deal ever offered for your 1974-77 Vega. This design uses the factory heavy duty (HD) mounting points. The 2 x 1.25" tubes are welded and epoxy is applied to the area where tubes meet the tank core end-caps for added strength. NOTE: GRIFFIN CHARGES A 50% RESTOCKING FEE. (RADIATORS ARE CUSTOM MADE TO ORDER AND MAY TAKE 2-4 WEEKS TO SHIP). Click here for radiator order form to pay via money order. Now an affordable performance aluminum radiator for your H-Body. Better cooling for your 1974-77 Vega (see Vega radiator mounting) at up to 400 horsepower when you install this Griffin radiator. For as long as performance radiators have been available, those made for the GM H-Body have always been elusive or much more expensive than a similar unit for other vehicles. Not any more, now get your Griffin Radiator here for the best deal ever offered for your 1974-77 Vega. This design uses the factory heavy duty (HD) mounting points. The 2 x 1.25" tubes are welded and epoxy is applied to the area where tubes meet the tank core end-caps for added strength. Click here for radiator order form to pay via money order. Now an affordable performance aluminum radiator for your H-Body. Better cooling for your 1974-77 Vega (see Vega radiator mounting) at up to 600 horsepower when you install this Griffin radiator w/ transmission cooler. For as long as performance radiators have been available, those made for the GM H-Body have always been elusive or much more expensive than a similar unit for other vehicles. Not any more, now get your Griffin Radiator here for the best deal ever offered for your 1974-77 Vega. This design uses the factory heavy duty (HD) mounting points. The 2 x 1.25" tubes are welded and epoxy is applied to the area where tubes meet the tank core end-caps for added strength. Click here for radiator order form to pay via money order. Now an affordable performance aluminum radiator for your H-Body. Better cooling for your 1974-77 Vega (see Vega radiator mounting) at up to 600 horsepower when you install this Griffin radiator. For as long as performance radiators have been available, those made for the GM H-Body have always been elusive or much more expensive than a similar unit for other vehicles. Not any more, now get your Griffin Radiator here for the best deal ever offered for your 1974-77 Vega. This design uses the factory heavy duty (HD) mounting points. The 2 x 1.25" tubes are welded and epoxy is applied to the area where tubes meet the tank core end-caps for added strength. Click here for radiator order form to pay via money order. Now an affordable performance aluminum radiator for your H-Body. 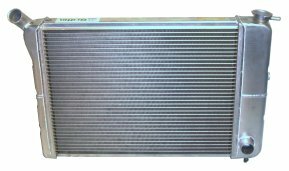 Better cooling for your 1975-80 Monza at up to 600 horsepower when you install this Griffin radiator w/ transmission cooler. For as long as performance radiators have been available, those made for the GM H-Body have always been elusive or much more expensive than a similar unit for other vehicles. Not any more, now get your Griffin Radiator here for the best deal ever offered for your 1975-80 Monza. The 2 x 1.25" tubes are welded and epoxy is applied to the area where tubes meet the tank core end-caps for added strength. Click here for radiator order form to pay via money order. Now an affordable performance aluminum radiator for your H-Body. Better cooling for your 1975-80 Monza at up to 600 horsepower when you install this Griffin radiator. For as long as performance radiators have been available, those made for the GM H-Body have always been elusive or much more expensive than a similar unit for other vehicles. Not any more, now get your Griffin Radiator here for the best deal ever offered for your 1975-80 Monza. The 2 x 1.25" tubes are welded and epoxy is applied to the area where tubes meet the tank core end-caps for added strength. Griffin Radiator - 1975-80 Monza 600HP w/ "Vega style straight inlet"
1971 - 77 Vega Radiator Mounting? The radiator we designed for the 1971-77 Vega uses the heavy duty (HD) mounting points where the clip-nuts are positioned (minus the HD radiator brackets). This allows the radiator to move forward, gaining about 1/2" of clearance, and saves the weight of the radiator mounting brackets. 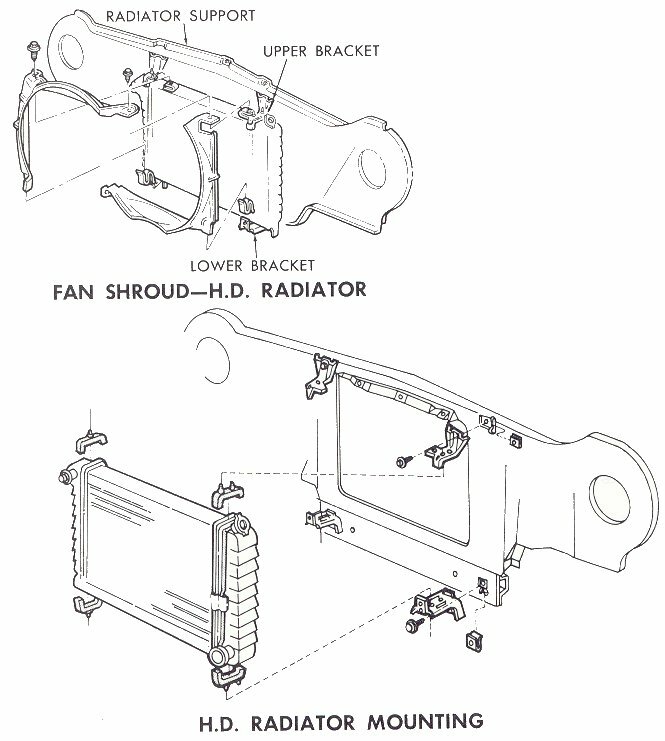 To see if this radiator will fit your 1971 - 77 Vega, study the diagram below and compare it to your Vega to see if you have these mounting points on your Vega. We have had numerous owners of earlier Vegas tell us, "The eariler Vega's do have the provisions for the HD Radiator mounting. The holes are pre-punched for the "J-clip". Installing the v8monza.com Griffin radiator was one of the easiest modifications I've ever made to my Vega!"